Hungaria Stamp Exchange On Display! 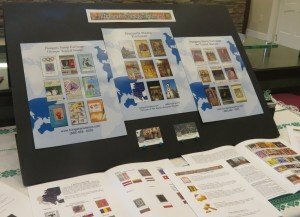 If anyone happens to be in the Merrimack Valley area of Massachusetts during the month of March, please stop in to the Lowell Five Bank in North Andover, MA to enjoy the Hungaria Stamp Exchange display. Included are posters on Eastern European Topical Stamps such as Art as well as articles which include Philately and the Modern Era Olympics.